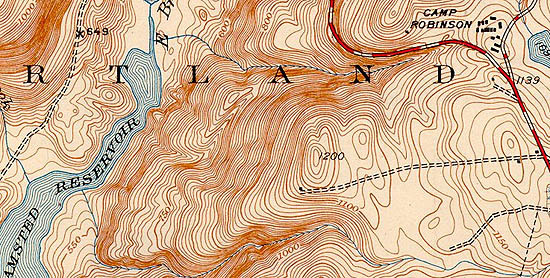 While Hartland Mountain in Hartland had a ski trail, a larger development may have been considered. The vertical drop of the area would have likely been around 700 feet. It is not known how serious or advanced this proposal was, but it is thought the lift served development on Mohawk Mountain in 1947 may have ended talk of the Hartland Mountain proposal. The Tunxis Forest Ski Cabin still stands and is listed on the Register of Historic Places.
" 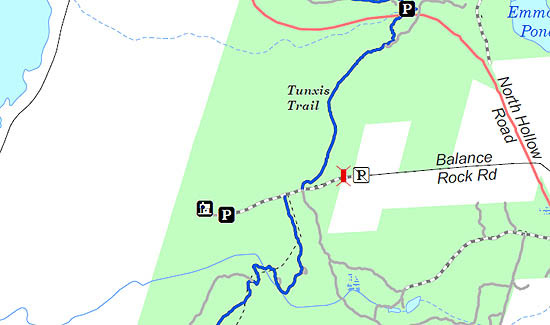 The Tunxis run is seven-tenths of a mile long, drops about 700 feet, and is recommended for the intermediate class of skiers "
" Shelter facilities at the Tunxis run include a cabin without windows but with a fireplace. " "Three Runs For Skiers Are Ready" Hartford Courant. 29 Dec. 1945.